One of the highlights of any trip to Liguria is to take the Cinque Terre hiking trail to explore the five villages dramatically perched on steep cliffs along the region’s coastline. Coming from the scenic Roman coastal town of Levanto, the Cinque Terre hiking tours take you to Monterosso al Mare, Vernazza, Corniglia, Manarola, and Riomaggiore, while coming from La Spezia they will be in the opposite order. Many are the ways to enjoy the Cinque Terre hiking trails, depending on the season, the weather, and how much time you have. 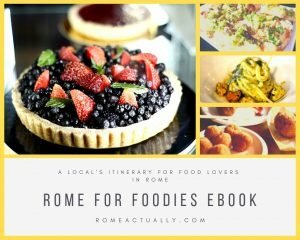 If you are short on time or are on a full Italy trip itinerary, you can take the train to each of them, and, depending on how long you want to stay or how much you will enjoy your trip, you can visit them all even in one day. Obviously, in one day you can hardly enjoy everything they have to offer, be it their churches, main buildings, narrow alleys and the Mediterranean landscape of the protected natural park. For as beautiful as they are, the UNESCO-listed towns of the Cinque Terre are not the only pearl of Liguria’s coast. 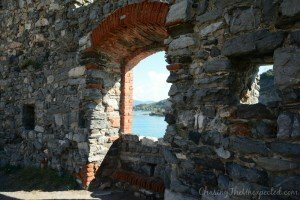 We visited also Le Grazie, Portovenere, and Tellaro to unearth the lifestyle and the history of this region of Italy, so we highly recommend these, too. 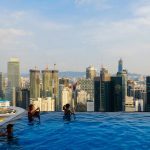 We visited the region more than once, so we stayed at two different hotels. The first time I stayed at La Francesca resort village in Bonassola, the second time in the lovely Le Grazie town at Hotel Le Grazie. La Francesca resort is very scenic and is located inside a large park, perfect for families with kids who can enjoy their holiday in their own private bungalow. You can read my detailed review here. We loved Hotel Le Grazie, located in the heart of Le Grazie town, in itself interesting to visit and quiet to stay overnight, is well-connected to Portovenere and La Spezia with several buses per day. From La Spezia, you can take the train to the towns of the Cinque Terre, and once there, from town to town you either walk through the hiking paths or take the train again if you are short in time. Each of the Cinque Terre towns has a train station and even in case of train strike, 90 per cent of the trains here are running. 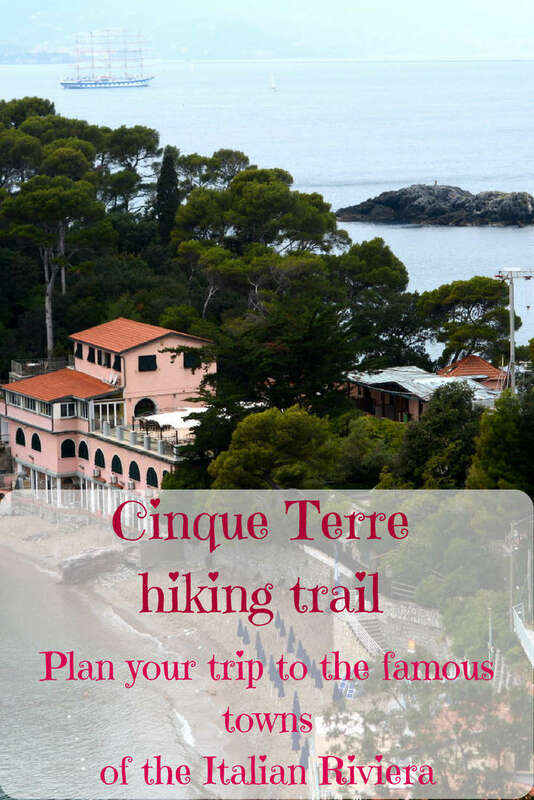 ⇒ Tip: Book one of the organised Cinque Terre hiking tours available such as this one to have a guide with you all the way. If you prefer a day tour, check out this 12-hour day tour from Florence or this boat cruise with lunch. Carry on on your Cinque Terre hiking route with Monterosso, probably the most touristy-looking, and the only one offering a long tourist beach, while the others retained more of their original appearance and probably traditional spirit and lifestyle. I was warned that Monterosso was mainly full of tourists and had little to offer, but I visited anyway because I knew Italian poet Eugenio Montale used to spend here his summers. I wanted to see his villa, which, however, is now a private residence so closed to the public. If you do get there, you can only have a peek through the fence. Even in the low season, how not to enjoy a tranquil December afternoon just sitting on the beach in Monterosso al Mare? I found it true that Monterosso is probably devoid of its original spirit, but still, there was something that caught my attention, a huge, bulky god Neptune on a rock dominating the beach, almost as if to guard over the sea life, his jurisdiction. One of the most popular towns of the Cinque Terre, Italy, and probably my favourite, is Vernazza. Favourite wedding destination among tourists, especially US citizens following Rick Steves’ efforts, the village hides a charmingly rundown view possibly around every corner. A lovely pastel-coloured hamlet dangerously leaning on an obstreperous stretch of Mediterranean sea and even more dangerously lying at the foot of a mount threatening landslides at every rain. Unsurprisingly, cues to the Mediterranean sea are almost never missing, either in its azure hues or in something that reminds of life in a seafaring village, be it boats moored in the dock, an opulence of fish-based dishes in every restaurant or the white of the sodium contained in the sea salt creeping up on the walls and the street tarmac. In October 2011 a deadly flood hit the 5 Terre, and Vernazza was one of the most involved: almost completely covered by the debris come down from the hill, during a massive flood when within four hours it rained the amount of a whole year, buildings flooded and destroyed. Now the towns are back to their original beauty, but memories of those days are very much alive in the minds and in the talks of the townspeople. Being set in a valley is their economic blessing and curse at the same time: now if it rains a bit heavier than predicted shops and restaurants are forced to close. A month before I went, I was told that restaurants in Vernazza centre near the harbour had to shut down, and the famous Via dell’Amore (Love Road) was closed because a rock had come down heavily injuring a tourist. Sadly, such rickety nature of the surrounding mountains is also due to the progressive abandoning of the agricultural work, as cutting down too many trees makes lands less steady and mountains easy to slide. 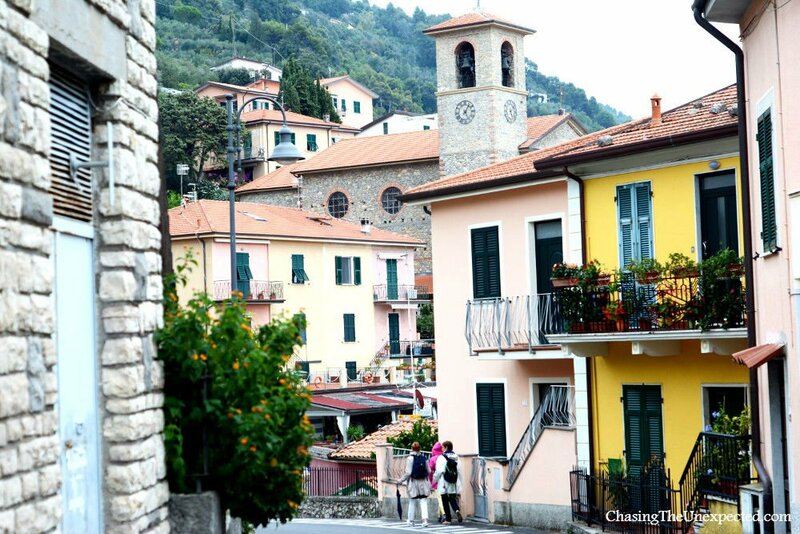 This is one of the must-see towns along your Cinque Terre hiking trail map. The town between Vernazza and Manarola is Corniglia, and from here you can enjoy a great walk in nature. Dating back to Roman times, Corniglia will strike you for its terraced fields, the ruse locals envisioned to develop their farming activities. The name probably originating from the term “gens Cornelia”, a prominent Roman family that was controlling the area at the time, before falling under the rule of other important clans during the Middle Ages. 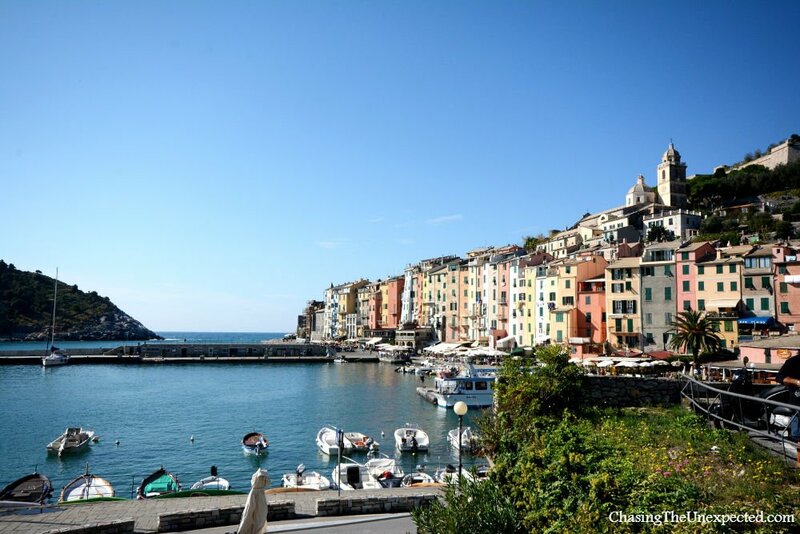 Like the rest of the Cinque Terre towns, also Corniglia offers a sweet beach stay as well as great hiking paths. For this, the best time to go is the good season, from spring to summer, as fall and winter can be rainy and prone to landslides, making the local authorities close some of the trekking routes. I did my Cinque Terre hike in December and even though I’m not really a practising Catholic, I stopped in Manarola to see the lighting up of the world’s biggest presepe, or Christian Nativity. Every year a presepe made of recycled material is lit up on December the 8th, day devoted to the Holy Mary when in Italy Christmas decorations are usually set up in all houses. This year, actually, it was not sure they could do it, as the man who every year prepares the event on the mount’s slope fell ill and didn’t guarantee he would have been fit enough for the show until the last minute. But he was helped by a team of locals so also this year the presepe sparked people’s evening. Once I got to Manarola, I knew the presepe was going to be lit up only after daylight had faded away, so I devoted some time to take a tour in Manarola, a simple and genuine town dominated by a mountain, with some houses in the valley and some on the slopes. As darkness was starting plunging on the quaint Cinque Terre, I headed to the church square, where a crowd of locals had already gathered to sing, dance, eat local delicacies offered the council and line up along the stone wall to wait for the sunset and subsequent lights of the presepe and fireworks. The proximity to the sea blessed the village with mild temperatures, and despite being winter and evening progressing towards the night, the wait was not heavy at all. Who am I kidding? We were *freezing* and couldn’t wait for the nativity to enlighten a bit our mood. Children were as impatient as adults, did the countdown at least ten times, but when lights were on, everybody was enchanted, and the atmosphere of togetherness in the community was enough to warm evening and hearts. 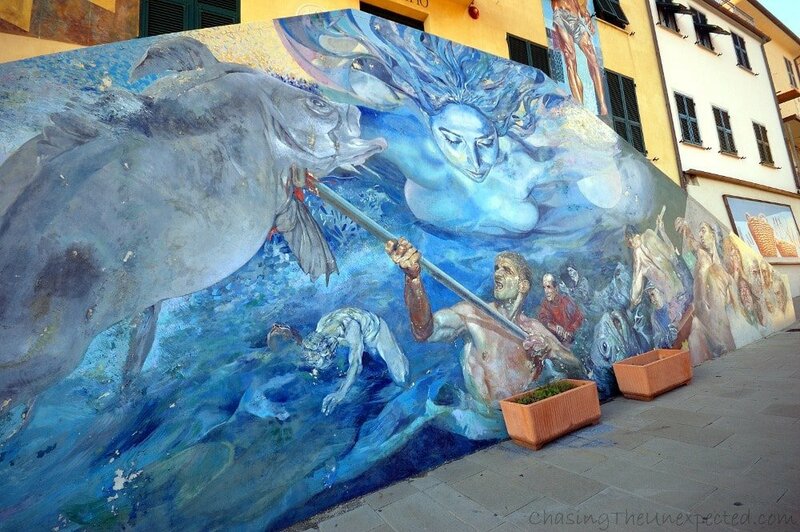 Street art in Riomaggiore, a must-see in your Cinque Terre hiking trail. As the date with the presepe was going to start around 5.30 pm, I went to Riomaggiore before getting to Manarola, visited its harbour, strolled around its city centre, enjoyed its murals and inevitably got lost its maze of alleys. Its views were breathtaking, its vibe very laid-back and the ambience exuded relax and lightheartedness. The small town of Riomaggiore boasts a great street art tradition. I managed to see many when I was wandering its streets, but very likely there’s more, as these ones scattered all over the place and the city’s squares were real masterpieces. Connected to the town of Manarola, also part of the Cinque Terre clan, via the so-called Lovers’ Path o Via dell’Amore, Riomaggiore is an ancient borough of La Spezia province and the easternmost and southernmost tip of the Cinque Terre. Believed to have been founded by Greek refugees fleeing from the persecution of Byzantine emperor Leo III the Isaurian, Riomaggiore is today a quaint little town that makes it for a perfect relaxing summer vacation lapped by the Mediterranean Sea and blessed by a mild climate and a great culinary tradition. My first visit to the Cinque Terre was probably spoiled by the fact that natural trails were closed and it was too short to fully soak up in their sea traditions, but certainly enough to sense their spirit and understand why the UNESCO decided to put this small fragile corner of the planet on its list of world heritage sites. For as famous as they are, Cinque Terre is not the only jewel along the rugged and scenic Liguria’s coastline. Defined by harsh land conditions, Portovenere’s residents are hard-working and industrious, crucial feature to keep up with the production of famous wines and agricultural goods in those otherwise challenging fields forcefully organized in a series of embankments. Now relying mainly on the tourism industry with an efficient organization of boats to show tourists the little islands around the town and the myriad of caves, one of which named after Lord Byron, a big fan of the area, until not so long ago what kept this part of Liguria region alive was the presence of hundreds of Navy officers training to be deep sea divers. Can I say that probably I preferred Portovenere to the more famous Cinque Terre? Cherished by Lord Byron, this rugged corner of the Mediterranean Sea is a bustling little town that in summer teems with tourists from all over the world. They have a great choice of traditional restaurants where you can find all types of meals with a preference for seafood and fish dishes. Even though small, in Portovenere you can visit the old church of St. Peter perched on top of the rocky cliff. This small church was built on the site of an ancient pagan temple devoted to the Roman goddess Venus Ericina, and part of the original floor is still visible on the right side of the entrance. Later, from the 13th century, several restoration episodes took place. Inside, even though of small size, the church consists of three naves and the main decoration pattern is horizontal black and white stripes. In the 15th century, a big fire damaged the church too, and later suffered foreign attacks as well as being used as a stronghold in defence of the local bay. Le Grazie is a town that owes everything to being set along the coast. Built right on the shore, skipping even the beach factor, this small city of some 3,000 people hosts the Varignano, the base where the Italian Navy trains its deep-sea divers, or “palombari“. This is the perfect place if you want a sailing holiday. From here (also from the other towns, especially Portovenere) you can rent boats and relax in a quiet area, but maybe not many people know that you can also have a fantastic historical walk to the ancient Roman road and villa which is reachable in five minutes from the main road Via della Libertà through a tiny uphill alley bordering the local cemetery. The opening hours for the Roman villa change depending on the season and you can read the updates from the board on the other side of the road from the beginning of the narrow alley that leads to the ancient ruins. Tellaro is another lovely town set along the scenic Liguria’s coast driving towards Tuscany. Its views and balmy sunsets are soothing for the soul, so much that even Italian writer, journalist, and movie director Mario Soldati chose to settle here for years (where he died in 1999). He had a boat where he would likely relax and take inspiration for his work directly from the Mediterranean waves, until one day it slipped its mooring, probably tied more in a writer’s way than a sailor’s, and was found at large close to Monterosso by the diver Cubeddu you met here who was patrolling the area on a Navy’s boat. Stroll around the uphill quaint streets of Tellaro, go up and down its coastal paths and enjoy the waves hitting the shore. Locanda Il Maestrale. 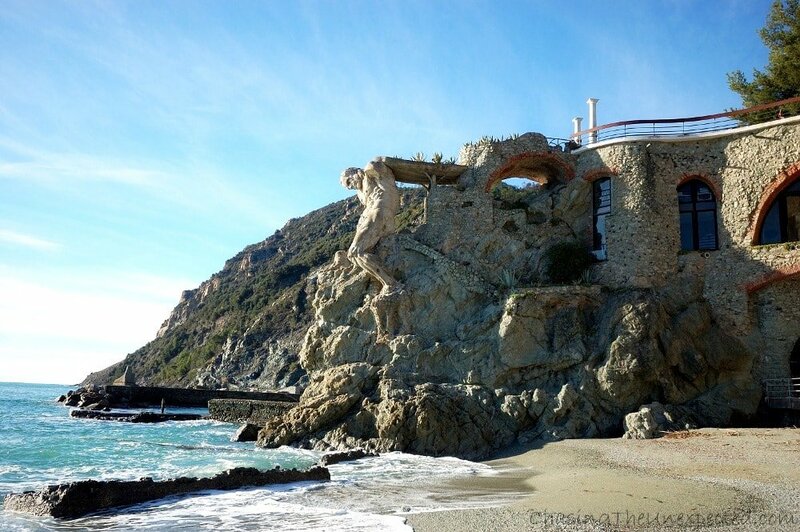 Located in the city centre and also very close to the beach of Monterosso al Mare, Locanda Il Maestrale is one of the favourites of the Cinque Terre hotels. Here, guests enjoy comfortable rooms with WiFi and flat-screen TV, a private garden, and a buffet breakfast. Vernazza Vacation 3. 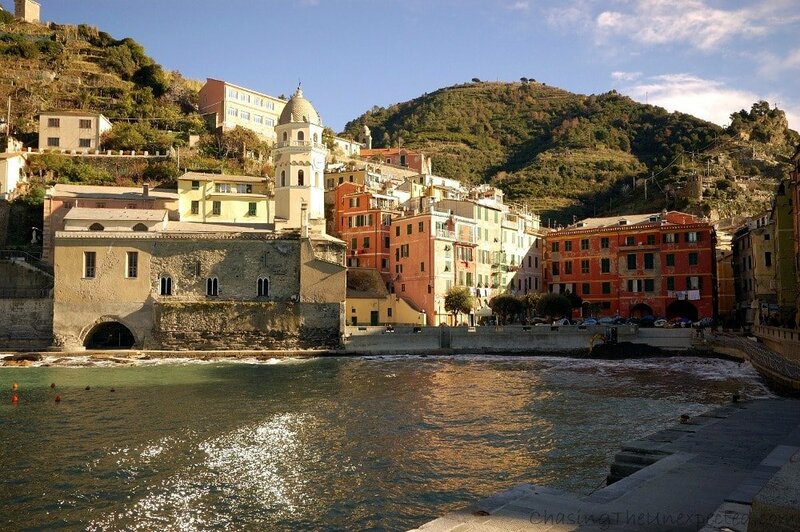 A cosy bed and breakfast in Vernazza, Vernazza Vacation 3 lies at 1-minute stroll away from the local beach. Rooms feature a private bathroom, free WiFi, flat-screen TV with satellite channels. Breakfast options include Italian and Continental. Da Baranin. If you would like to stay in Manarola, Da Baranin gives you the possibility to choose between a room or an independent condo. All rooms and flats feature a private bathroom and TV, while the WiFi is in the common areas. Breakfast includes sweet and savoury options. Click here for availability and price. Giovanna dei Rocca. For those who prefer a homestay, in Riomaggiore is the beautiful house of Giovanna dei Rocca that provides rooms complete with a private bathroom, flat-screen TV, air conditioning and free WiFi. The kitchen includes a fridge, a coffee machine, a stovetop, and a washing machine. Click here for availability and current rates. Hotel Le Grazie. I mentioned Hotel Le Grazie also below in the restaurants because not only guests of the hotel can go. I highly recommend it also if you are looking for an accommodation around Liguria’s coast and La Spezia province. It’s comfortable, very clean, affordable and central. You will also have a delicious breakfast both savoury and sweet with a great choice of pastries, teas, coffee, cappuccino and fresh fruit. The bus stop for Portovenere and La Spezia is literally 2 minutes walking. Resort La Francesca. Located in the small town of Bonassola, Resort La Francesca is perfect for families and couples. The resort features small apartments surrounded by greenery, a swimming pool, a restaurant serving traditional local cuisine, and a golf and a football field. It lies a few minutes walk from the beach, a scenic stroll away from Levanto and also close to the five Cinque Terre villages. I stayed at this hotel some years ago and it was very comfortable and pleasant. You can walk around the premises steeped in history and rich in nature. Oasi Hotel. Located in the heart of the lovely town of Levanto, Oasi Hotel is a great choice for who wants to enjoy both some beach time and the local history. Easy to reach from Levanto train station, the interior is decorated with bright colours and wooden floors. The rooms feature an LCD TV, air conditioning, and complimentary WiFi access, some have a balcony, others a private access to the garden. Every morning, a Continental, Italian, and American buffet-style breakfast are served including gluten-free options. Il Fico. If you are in Tellaro, enjoy at least a meal at Il Fico Trentacareghe fish restaurant for high-quality food, delicious dishes, a simple and tasty cuisine where you can bet all ingredients are seasonal and fresh. Address: Località Fiascherino 7, Tellaro, SP; phone: +39 0187 304242; e-mail: info@ilficotrentacareghe.it. Le Bocche. Portovenere is packed with restaurants, and I’m sure they are all good. The one I tried and loved is called Le Bocche, previously known as La Taverna del Corsaro (The Pirate’s Tavern). They serve the traditional specialities, mostly fish and seafood dishes. Address: via Calata Doria 102; phone: +39 0187 790622; e-mail: lebocchesrls@libero.it. La Marinara. This restaurant and pizza place is in Le Grazie, located on the main road. At La Marinara you can order a delicious pizza choosing from many different toppings as well as several first and second courses both fish and meat-based. End your meal with some pretty scrumptious desserts. On weekends, booking is recommended. Address: Via Libertà 14; phone: +39 0187 790076; e-mail: lamarinarasrl@hotmail.it. Hotel e Ristorante Le Grazie. This, too, is in Le Grazie town and is also a hotel. The restaurant of Le Grazie hotel serves both fish and meat dishes, alongside different types of pasta. Everything absolutely delicious, fresh, seasonal and very affordable. Address: Via Roma 43; phone: +39 0187 790017; e-mail: info@hotellegrazie.com. Really enjoyed this. I haven’t been to Cinque Terre in more than 15 years, but I long to return. Now I’d like to do so when I can experience the Presepe. Cinque Terra is a lovely area. I have visited twice now, once in winter and once in summer. It is sad to hear that the walking trails are currently closed as they were definitely a highlight of previous visits. I agree that Vernazza and Riomaggiore are real highlights! I think after the major flood they are being extra careful, recently a rock fell on Via dell’Amore injured a tourist, so now it’s closed and probably it will stay such until the good season.. I love this area of Italy, the country where I live. Your post brings back memories and reminds me of places I must revisit!